I’m not going to beat around the bush here: Homeworld: Deserts of Kharak is the greatest RTS I have played since I first started flirting with StarCraft II. It’s blessed with the detail of Wargame, the interesting terrain of Company of Heroes and the iconic style of its space-based predecessors. Diverse, distinct units; a genuinely compelling sci-fi story of mythic proportions; and absolutely the best sound design in the genre work toward making it a stand out RTS. 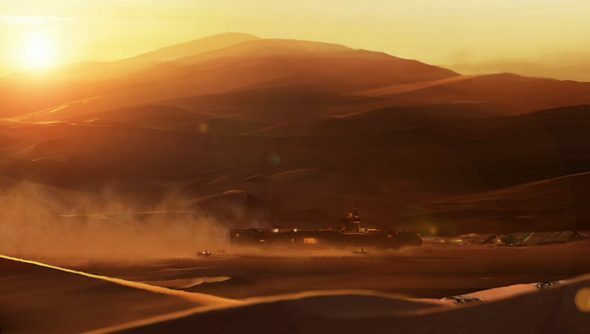 There’s a greater than likely chance that you’ll see Deserts of Kharak added to our list of the best strategy games on PC soon. Unexpectedly, however, it’s Kharak itself, the giant dusty world the game is set on, that’s helped Homeworld get its claws in me the most. It’s unexpected because my greatest worry was that Blackbird Interactive had made a big mistake by not setting the third Homeworld in the series’ traditional battlefield of space. It wasn’t a mistake at all. Homeworld is a space strategy series, right? It’s all about traversing the intimidating blackness between worlds, alone and vulnerable, sending tiny ships into huge, elegant battles. How could that be transposed to a planetary setting? The first two Homeworlds are such Big Deals™ because they set the bar for space warfare. Maybe, though, that’s exactly why this third installment leaves space well alone. Certainly, no other game has raised the bar (though Sins of a Solar Empire did wonderful things in a different direction). It’s all worked out, thankfully, because Deserts of Kharak does for ground-based strategy what Homeworld did for space. 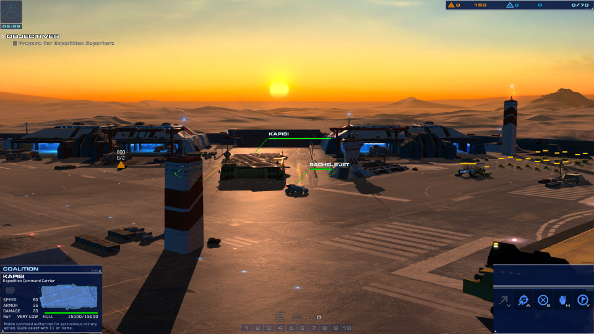 The first thing you notice is that Kharak is gorgeous. It’s a dying world that’s full of sand and howling winds and fighting factions – but it’s stunning. The maps are ostensibly just one desert battlefield after another, but each is elevated by touches big and small that bring them to life. Twisting, deadly tornados; ancient, fallen ships; nigh-impenetrable sandstorms; and gentle, sloping dunes that might just be hiding an army behind them. Oh yes, line of sight is a big concern, even in the desert. Especially in the desert. You’re merrily driving your little army across the sand, minding your own business. It’s nice. It’s peaceful. And at a glance, it’s pretty flat. Nobody could blame you for being lulled into a false sense of security. But then the radio crackles to life. Incoming. Red spots appear on the map, and too late you realise that ‘pretty flat’ and ‘actually flat’ are worlds apart, and that small dune that you can see, off in the distance, was hiding a group of ambushers. And now you’re really in trouble, because they’ve taken the high ground. Even a subtle change in elevation can make a big difference in the middle of a firefight. Not just because of the benefits of the high ground, but because some rocks or a dune can also block your fire, forcing you to spend precious moments repositioning your units so you can finally attack. With that piece of knowledge, even a seemingly featureless slice of desert becomes a tactically interesting battlefield. Sensors, aircraft and fleet scouts prove to be instrumental in victory time and time again, but the greatest tool a commander can use is the sensor map mode. 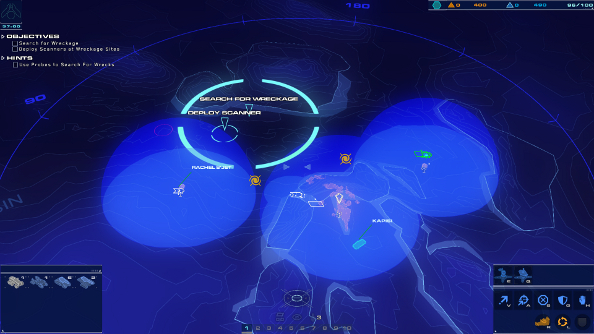 In the original Homeworlds, it made the scale of the space-based battlefields easier to manage, letting you see where all your ships were and when enemies were in sensor range. Here, it does the same, but it also reveals the nuance of the terrain, offering a topographical view of the map with colour-coded elevations. This is particularly important when you’re moving your carrier. 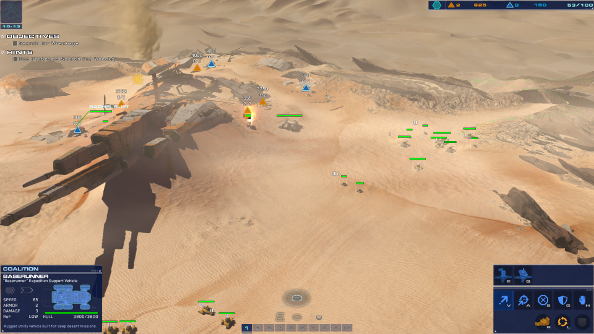 The carrier is, essentially, Deserts of Kharak’s version of the mothership. It’s the most important unit, where you build your army and do your all fancy sci-fi research. It’s a lot more active, though. It’s mobile command centre, a powerful weapon, and can be tweaked by redirecting power to various systems like attack range or speed. There’s just one problem: it’s massive. And since it’s so gargantuan, it can’t climb up higher dunes or get through narrow canyons or valleys. So before taking it for a ride, a bit of time spent perusing the sensor map can save you a lot of pain and misery later on. Smaller vehicles are a lot less restricted. They’re built for traversing the unfriendly dunes. Some are more adept – quicker – than others, but it’s easy to keep your units together. For instance, you can designate a particular unit, maybe one of your stalwart cruisers, as the centre of your force by telling all the other units to defend it. They’ll match its speed and surround it. 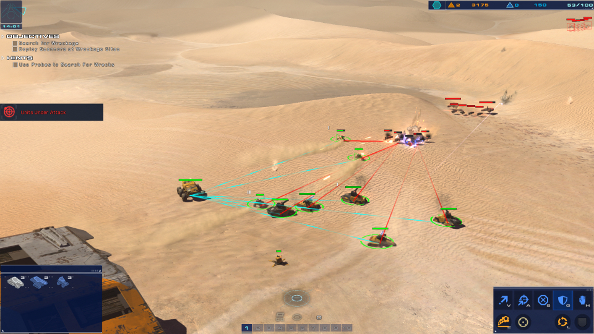 Deserts of Kharak is all about commanding battle groups rather than single units. You can give individual vehicles orders, sure, and in the middle of a scrap you’ll undoubtedly want to do that, as you activate special abilities and get more selective about your targets, but you’ll spend most of your time managing squads. It feels a lot like managing a space fleet, as they intelligently move into an appropriate formation depending on the combination of units, tearing across the battlefield like one very purposeful entity. They still dance! That elegant ballet, as ships weave in and out, circling and retreating and advancing as they see fit, it’s all replicated. The shift to the ground hasn’t forced Blackbird Interactive to limit units to standing around in battle lines, drearily exchanging fire with the energy of a sloth. Some vehicles will hang back and snipe or launch barrages of missiles, but their close-range companions speed right up to their foes’ faces, surrounding them and circling them like birds of prey. Battles, then, are just as dynamic and kinetic as they were in space. Even the fondly remembered trails the ships leave behind are here, though they are now plumes of dust and sand kicked up by thick, military-issue tires. 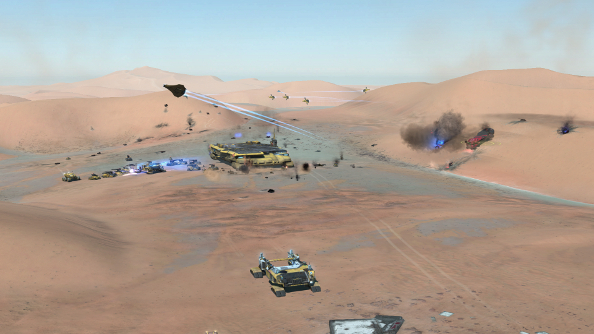 The vehicles interact with the desert in believable ways. The dust plumes, the tire tracks, the way a buggy’s suspension bounces and rattles as it speeds across waves of sand. Some vehicles hover, but even the ones that are bound to the ground spend a fair amount of time in the air as the sand creates natural ramps. The physics makes them wobble and rattle and sometimes almost capsize, when they find themselves driving at awkward angles. It makes watching a convoy traverse the dunes a singular delight. This all adds to that sense of vulnerability. A vehicle won’t break down, but it looks like it could. They look like they’re more than textures and wireframes; they’re real vehicles racing across a tangible battlefield, and inside each of them are men and women, crews, who chat on the radio and run systems tests and calibrations, occasionally spreading intel throughout the army. Is Kharak a better place to fight than space, though? It’s certainly busier, full of obstacles and terrain that forces you to be more thoughtful about your approach and how you position your units. The desert is a lot like space, vast and intimidating, but its hills and storms and the wrinkles it adds to things like line of sight keep you on your toes more. Space is more haunting, more awe-inspiring, but ultimately I think that Kharak has proved to simply be more interesting.